Farmhouse style is welcoming, comfortable and full of charm. 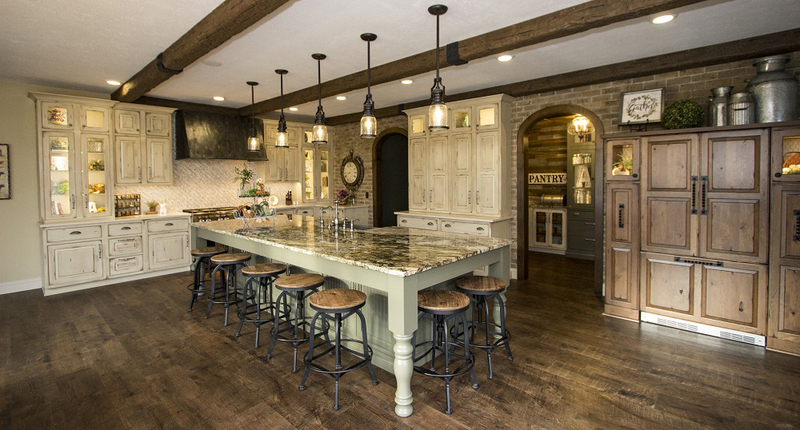 This Summit County kitchen embodies all of the signature elements that make the Farmhouse style so popular. This country look certainly doesn’t mean you have to live in the country either – it can be achieved by anyone, anywhere! Read on to learn about some of the farmhouse details that you can incorporate into your own home. 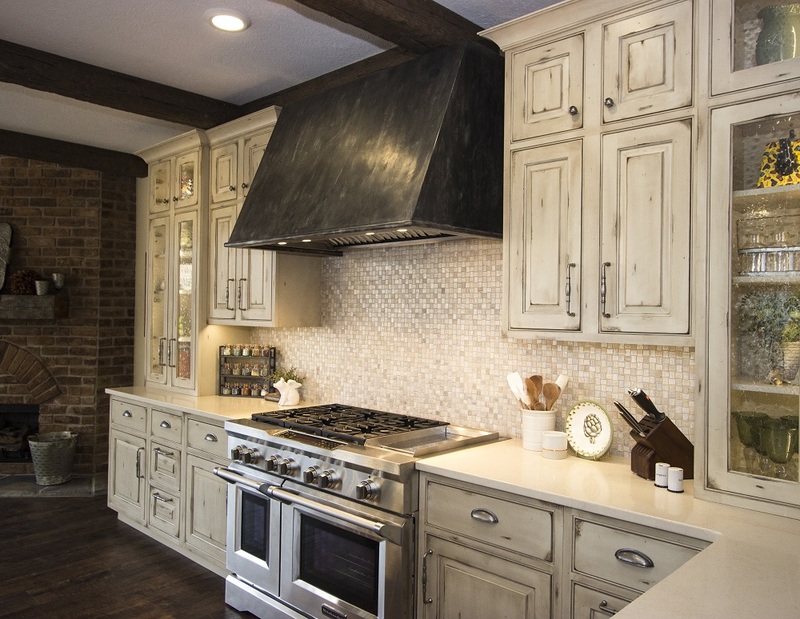 The more rustic and worn the cabinetry, the better for achieving Farmhouse style. 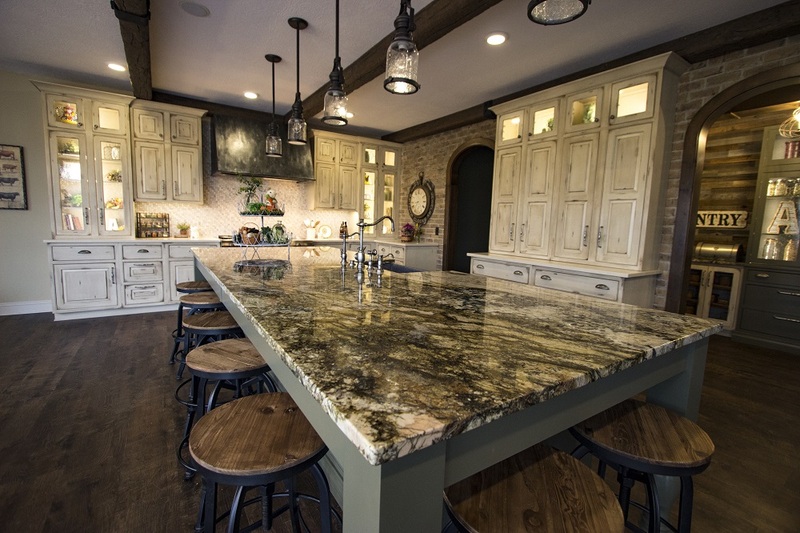 This kitchen features Shiloh cabinetry with an olde world finish. These beautiful cabinets are brand new but with the hand-applied finishing techniques they have that lived in look which perfectly represents the farmhouse style. Farmhouse styled spaces are warm and often draw from colors and materials found in a country/farm setting. 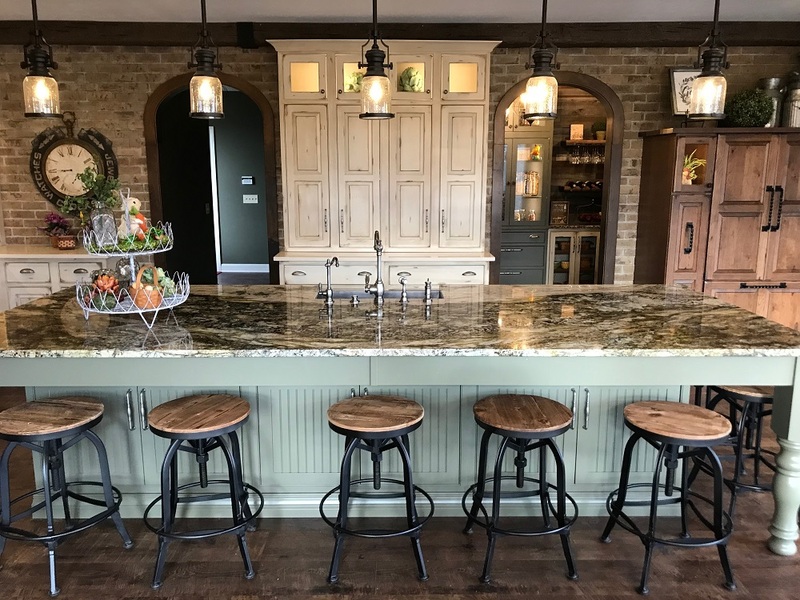 This kitchen draws warmth from the wood and the brick and a touch of soft color is brought in through the island – Sherwin Williams Jade Dragon. The island is topped with Barracato granite. 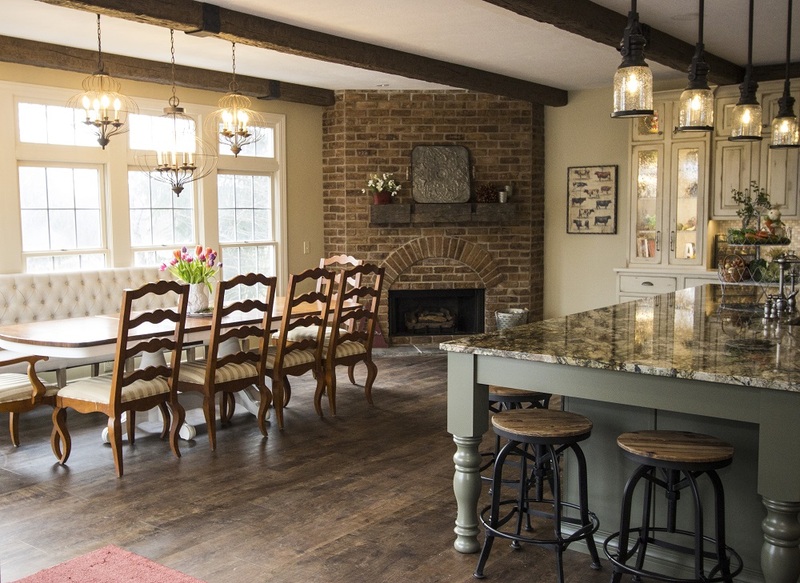 Wood is essential in a farmhouse kitchen whether it be the flooring, cabinetry or architectural details such as ceiling beams. Brick walls and fireplace adds to the warmth of the space. Metal accents such as the custom zinc range hood and industrial style bar stools give the space contrast. There is a great deal of texture in the farmhouse style from the weathered, rustic cabinets, flooring and even wall treatments. The beadboard paneling on the kitchen island is a classic farmhouse detail. 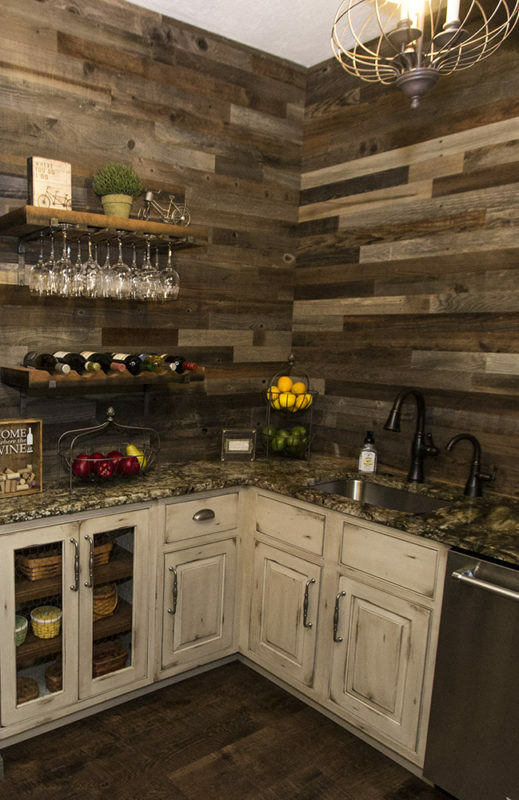 The furniture style cabinetry gives the kitchen a casual appeal that farmhouse style is all about. The wood planking on the pantry wall gives off so much warmth and makes the space all the more inviting. Open shelving is a classic kitchen staple that is both beautiful and functional. You can find everything you need in this pantry with most of the cabinetry being open. 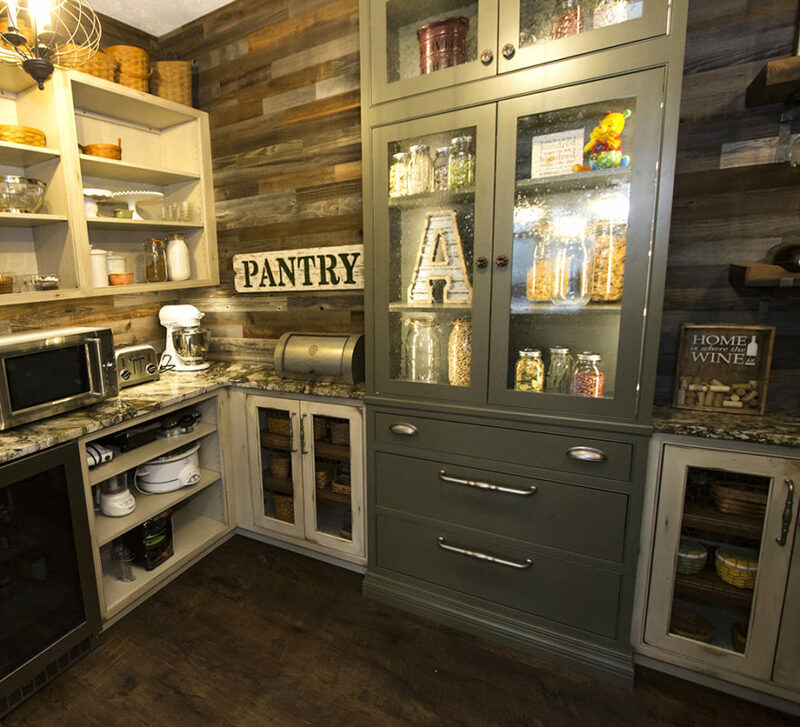 Some of the cabinetry even has a chicken wire accent which adds a little personality and charm. 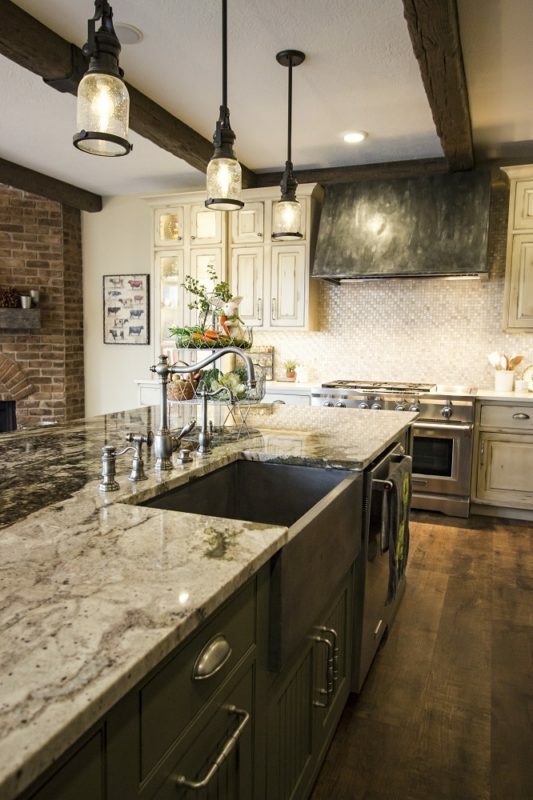 One of the signature details of the farmhouse style is the apron-front sink. These hardworking sinks are not only functional but act as a decorative feature and can be found in a variety of materials from porcelain, stone, metal, and concrete. This beautiful space designed in the farmhouse style is warm and inviting. The large wood dining table with shaker style chairs brings that extra sense of welcome to the space. Ready to get started on your own home project? Call us at 330.225.6000 and speak with one of our design consultants or click here to tell us about your project.